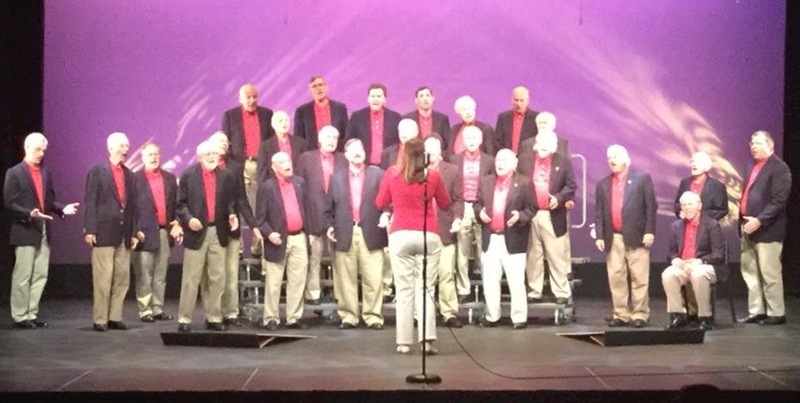 The Singing Capital Chorus and its annual delivery of singing valentines for Valentine's Day throughout the DC region, is the subject of a recent feature story on WAMU-FM, the local NPR radio station. We provided some holiday cheer for shoppers in Connecticuit Avenue on December 9, 2018. While it wasn't a white Christmas, the weather sure felt right for some snow!. As described in the Washington Post, there’s something about the Christmas season that makes us want to sing together. The chorus perfomed for an enthusiastic sidewalk audience as part of Tenleytown's annual Art All Night on September 29, 2018. We had the privledge once again to sing the National Anthem at a Washington Nationals game in Nationals Park, on September 4, 2018. This year our performance was enhanced by the largest Singing Capital Chorus contingent ever: 63 robust, enthusiastic and hearty singers. We had fun performing at Studio Theater's Taste of Studio event, along with other community musical and cultural groups on August 4, 2018. On April 30,2018, President Stan Marcuss and the chorus honored Sheryl Berlin, our Associate Director from 2007-2017, and surprised her with a special version of “My Girl”!. We will miss you Sheryl in our weekly rehearsals, but we know you are still part of the barbershop family. John David Maybury appointed as the new director of the Singing Capital Chorus. Read more about John David Maybury appointed as the new director of the Singing Capital Chorus. 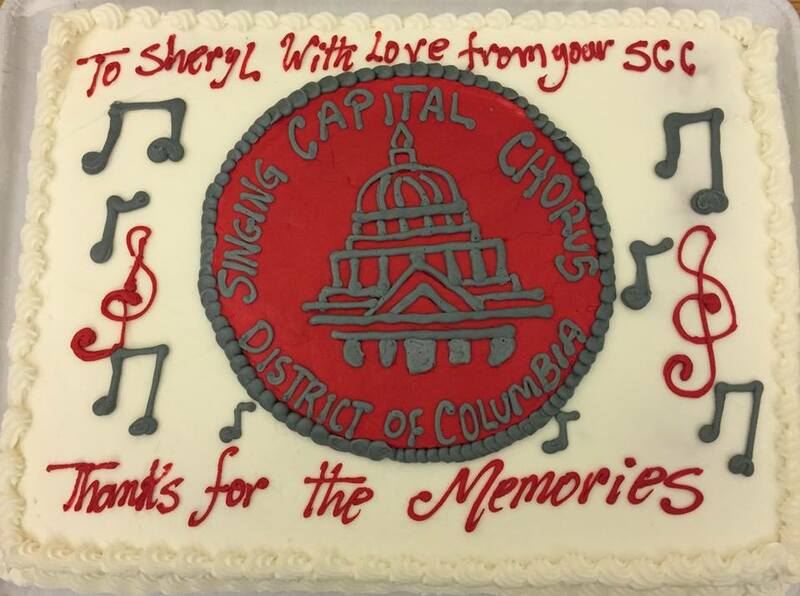 Our 2017 holiday party was bittersweet as we commemorated Bill Colosimo’s retirement after 25 years as the director of the Singing Capital Chorus. The evening was filled with singing and warm remembrances, and included many friends and family members of the chorus. Sheryl Berlin also announced that she would be stepping down from her Assistant Director role to allow her to spend more time sharing her love of barbershop with young people. Read more about Bill Colosimo retires! We presented “A Cappella Magic”, our 71st Harvest of Harmony on Nov. 4th to an enthusiastic audience at the Greenberg Auditorium. The show included chapter quartets Foggy Bottom Four and Legacy (featuring Fred Peters, celebrating his 100th birthday! ), guest quartet Capital City Close Harmony Club, and our featured guest quartets Da Capo and Knock Out. Thanks to Tenleytown Main Street for hosting our Saturday performance in your neighborhood for DC's Art All Night! We had a great time sharing close harmony men's a cappella sounds with a large, welcoming group of new fans!